I saw New Kids open for Tiffany (just process that sentence for a second) when I was nine and fell in love instantly. My mom took me to buy their album the next day. I was always a Joey girl. Still am. I didn't get to see them in concert again until I was 30. Fast forward many years. I have three boys and one had to be treated for a life threatening issue at Massachusetts Eye and Ear in Boston. We became involved in speaking engagements for MEEI. We were invited to the Sense-sations gala in 2015. The gala is a fundraiser that was created by Joey after his son was diagnosed with a hearing impairment. New Kids were slated to perform that night. My friend and I were with my three year old at the cocktail hour and I spot Joey and his family across the room. I got all jittery but didn't move. I didnt dare go talk to him. My kid solved that problem. Foster, my son, had never ridden on an escalator prior to the event. There were several sets that he rode up and down following rehearsal and he continued to ask to ride them. While I was staring at Joey, Foster took a run for the escalator. Joey grabbed him and picked him up before he got there. Thanks for the intro, kid. I went over and blathered about being honored to speak and what great things he has done for early intervention for speech and hearing (I am a speech-language pathologist) all while my kid was throwing himself between us. He was the nicest guy. The night was amazing. My kid still asks about the "singer guy at the Gallup." Thanks for creating your podcast! Please watch Foster's story - but be prepared...you may need tissues. Jerusha - you are amazing - thank you SO much for sharing your story. The next time you're up this way, we need to hang out, but (of course), POIDH. Sitting and thinking about when I was first introduced to New Kids on the Block. It is quite simple living in Connecticut not that far from Boston listening to the radio as a child of course I heard them!! Then it was some time 1986 only 5 years old still my best friend at the time came running out of his house screaming the tape has been released. My grandfather did not even get a chance to get into the house from work I was outside yelling we must go to Bradlees and buy it NOW!!! As one can tell from that I was spoiled. Lol We went to the store and I got my New Kids on the Block tape. I was super young but I knew from the start I was hooked. Walking through the stores with my grandmother I would see magazines and make her buy them for me. I would hear on the radio they would be here and there but my grandparents would not take me to see them. However, the first concert I went to may not have been the guys but it was a few months later of 1986 when the Beach Boys came to the high school a few blocks from my home. My grandfather took me to see that. I knew that now my first concert ever was over I may have a chance the next time the New Kids on the Block go on tour. Fast forward a few years we are now living in Florida, I am now a lot older lol 4 years to be correct. The New Kids on the Block are going on tour again. By this time my bedroom walls were covered in posters of them, my bed and pillows were of them, my Barbie’s husbands were either Jordan, Donnie, Joey, Danny or Jonathan. I had a bumper sticker on my mirror, pins, shirts, hats puzzles glued together, all over in my room. I do not remember exactly if I had asked for the tickets to the concert or if my grandparents just bought them for me, but whichever way it was I was going to their concert. March 20, 1991 Orlando, Florida my first real concert!!! It was my grandmother and I in okay seats. I did not care I was there. Seeing them live not on television was amazing. Singing, screaming, and of course dancing!!! My love continued to grow for them!!!! By that time, I knew Joey was my favorite and oh how did I want him to be my boyfriend lol. Of course, that was not possible I was not stupid, but in my dreams, it was reality. When they broke up my heart was broken, I was a little older and started to listen to other types of music, but my love for them never ended! I continued to listen to them even though they did not come out with any new music and they were living different lives. Super-fast forward after way too long of them being apart they were back together!!! I am now a mother of 2 girls and back living in Connecticut, where listening to their music started for me! It is announced they are back together, new music, and a tour. Even before I could ask my best friend and godmother to one of my daughters I buy tickets again they were not super close, but we were going to be there!!! Every two years when they are on tour my seats have become better and better, my love for them not sure how it is possible, but becomes stronger and stronger. Two years ago, was my first barstool seats, my first meet and greet. Walking on that stage and talking to them made me real like a teenager again. Seeing Joey sooo close and talking to them, hugging them, and standing next to my love I was shaking!!! I was so scared, nervous, and excited all at once. I survived lol. I had been following them on social media but they were not all as active as Donnie. My love for Joey will always be there but now I have almost the same amount for Donnie. My older daughter before she started listening to her own types of music liked Donnie, and had joined me 2 years ago at the concert and the meet and greet, and my younger daughter loves Donnie and joined me this year for their concert, barstool seats, and meet and greet. However, this was not her first time meeting the guys. I was also lucky to win tickets to their MSG concert from Block Nation, it was pretty cool being in the crowd when they brought on 50 Cent and Mark and Donnie's nephew. The next morning is when they were having the ribbon cutting for Wahlburgers at Coney Island we were there and my little one got her first picture with Donnie and could talk to him for a few seconds. Then when the guys were at Wahlburgers Coney Island again with the radio station 103.5 KTU we could go and meet them again. Unfortunately, when we arrived Jonathan had left already and Jordan was on his way out, but we did get pictures and a few seconds with Danny and Donnie. Last year, we went to mixtape and my older daughter and I could go to the preparty. Which we got out wonderful pictures with the guys except Jon L. Then the next day was the concert and we had pretty good seats but not front row. My little one Alexis had a tantrum because Donnie was not close enough for her. I had to explain repeatedly do not worry you will see him at the after party. We could have the meet and greet with Paula Abdul, which was amazing because she was my mother’s favorite singer. Then was the best part of the weekend the after party with them. This would be my first after party with them. It was amazing!!! I was just so happy to be with them in a much lighter setting. Alexis was not playing she was going to get to see “her Donnie”. While trying to get closer to the stage and to where he was standing and taking pictures was extremely difficult. Until a Blockhead sister turned to me and asked if it was okay that she brought my child to get a picture with him. I was scared to let my daughter go with a complete stranger but in my heart, I knew it was okay, she was a blockhead sister and knew she had nothing but the best intentions (to get Alexis near Donnie for a picture) in heart and mind. I allowed my daughter to go with her as I stood behind watching every step they took and standing next to the blockhead sister’s friend. I was watching the guys on stage and watching my child being led through the crowd at the same time. (So happy I can multi task). Then about 15 minutes I would say later here comes Alexis jumping up and down with a smile from ear to ear on her face. She got her hug and picture with “her Donnie”. I could not stop thanking the blockhead sister for pushing her way through the crowd of blockheads to help my daughter get her picture!!! As the months went we were hoping for another tour especially since it came out of Paula’s lips at the after party lol. The tour was announced, tickets went on sale, I was lucky enough to again get barstools. This time I would bring Alexis with me since I had promised her at mixtape that the next time they go on tour she will be right with me in the front row. Christmas 2016 Alexis opens her last gift and was could it be?? A few old school buttons of Donnie and a print out from Ticketmaster saying the tour and the seats. Did my ears hurt after she screamed her head off once she read the print out!!!! Then it began the count down every day!!! Sooo many days before the tour started never mind when it was our day. Watching other tours and already knowing about Donnie bringing fans on stage for Cover Girl, Alexis was determined and of course I was too to get her on that stage! Then I see from watching this tour from videos that were shared that they bring up a birthday girl. My concert was July 6th my birthday is July 10th. Never know, right?!?!?!?! 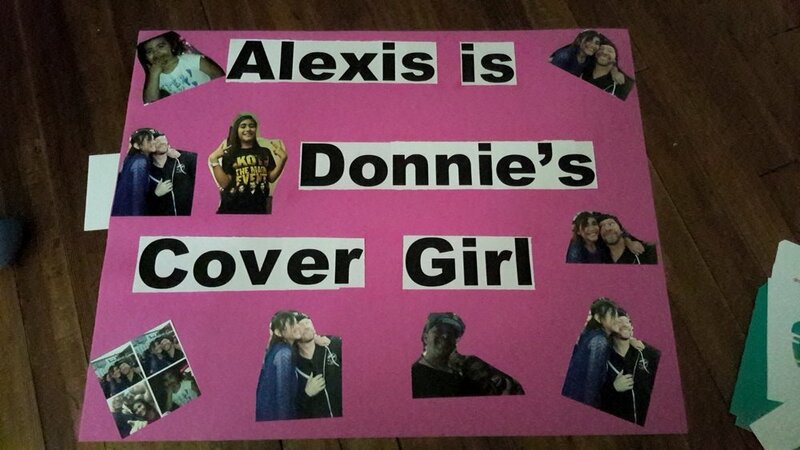 A few days before our concert we made a poster of all the pictures of Alexis and Donnie saying that she is his cover girl. I had a shirt also made with all the pictures for her to wear after the meet and greet. When we met our group of ladies for our picture they were all awesome!!! Made us feel very comfortable!!! We patiently stand in line waiting to be checked in and to get out lanyards. While checking in I told them that my birthday is not for four days, and they said its okay they would put my name down just in case. They put my name down and took my picture just in case I was chosen and they need to find me in the crowd. Now it was time to go into the arena and patiently wait to have our pictures with the guys!!! As we were the last group to go up for our pictures Donnie looks at the old school pins on Alexis’s dress and the I heart Donnie pin caught his eye turned to her and I and said that he cannot promise but she may be his cover girl. After that we do shopping and then get ready for the concert. Concert starts after Paula we quickly go to the bathroom. We get back and the pretty lady with the red hair comes up to me and tells me I am their birthday girl. OMG is all I can say!!! Super excited a little upset wish I knew before I went the bathroom so I could have fixed my hair and face a little, but that thought faded quickly. They come one everyone is screaming and super happy, singing, dancing and mostly screaming lol. Cover Girls first few notes come on and Alexis gets upset because she sees that Donnie is on the other side of the stage. Suddenly, I am guessing Johnny comes behind Alexis and me and tells me she must kneel or sit on the barstool she starts to cry because she really wants to be Donnie’s Cover Girl then he asks me does she want to go on stage I said of course. Then within a millisecond my Alexis is on stage with Donnie. What an emotional rollercoaster that was from crying to beyond happy. After that we continue to love every second of the show then the pretty lady with the red hair comes over to me and said come on. Then it was my turn to go up on stage. After 31 years of wishing something like that would happen it was happening. Being up there with them singing Happy Birthday wow I could have died and been okay with it. Having Jonathan staring into my eyes while singing OMG!!! Donnie recording the whole thing on my tablet, Jordan kissing my hand and then the group hug at the end was all a girl can ever wish for!!! Then the morning of their Fenway show this year blockhead sister Nikki offer 2 tickets for a very nice price. This was so special and meant so much because normally my baby sister goes to the concerts with me but this year I was not able to afford her ticket and she was out of work. So thanks to Nikki we were able to experience their tour this year together in their hometown!! Memories that will last forever!! Tonight, we did our video for Donnie’s birthday and cannot wait to see the finished product. Now it is time to count down to see if they will be at mixtape next year and then their tour in 2 years. Also, a Wahlburgers is opening at the local mall can’t wait for that!!! Thank you for taking the time to read this. I love our 5 guys from Boston and the millions of Blockheads out there!!!! I am a grown women! What's wrong with me!! It was a cold day December day in Boston in 2008 (this happened in Lynn and Charlestown - we followed the set to a different location because we were CRAZY). Me and another fan who had met at a concert, found out Donnie was going to be filming in Charlestown. 20 mins away from us , I picked her up and off we went to stand in the cold of Boston for over 7 hours. It was raining and 34 degrees out. It was brutal but we stood there... hoping. We got some eye rolls from set staff but …whatever. We were on SET. His bodyguard cane over again and said "Donnie would like you all out of the cold. He has no idea how long he will be to come say hi.” Donnie WANTED to come say hi. He actually was thinking of the 15 or so fans standing in the cold, waiting for him! The bodyguard then said "come with me”. As a group we stuck to the bodyguard like glue. He moved, we moved. He stopped we stopped. We walked SO tight as a pack of girls that we could feel each other breathing. We were all soaking wet, we were all cold. We all (because we are insane) followed the random guy that claimed to be Mr. Wahlbergs Bodyguard. We stopped in front of a trailer and he opened the door and said "go on in"
We were just invited in Donnie's trailer! After another hour we were told "come with me”. We again followed this man we did not know, out of the trailer and then INTO the Lynn Item newspaper. We were brought inside the set of the tv Pilot Bunker Hill. We were staring at Donnie doing a scene on the monitors. Sadly this show was never picked up. It looked amazing. After watching 2 or three takes Donnie walked over and said “hi”, asked us if we warming up, and then back to work. totally a gentleman, asking the ladies if they were cold. Once on set, he was totally goofy. At one point he had his back to the camera and was looking at us. He was sticking his tongue out, smiling, being goofy all while the scene was being filmed. It was so fun. We were then again told "don't move”. I don't think any of us have ever stood more still, or more quiet. Donnie walked back over signed some autographs and we were escorted out. As we were disbursed his bodyguard chased us down and said wait “Donnie needs you”. Wait- what?! Donnie Wahlberg needed ME? What on earth for… never mind. Yes.. I’m there. We were escorted back to his trailer where he finally joined us. It was after dark. We were cold and wet but we didnt care. We were in an 8x8 room with DONNIE WAHLBERG! This was back in his "free hugs” days. He had promised to keep giving out free hugs to all his fans. To keep signing copies of The Block if someone handed it to him. Sadly, I didn’t bring my copy that day. He made my day and it's such a fun story to tell. We also did run into Jordan that day but he was more aloof than Donnie. 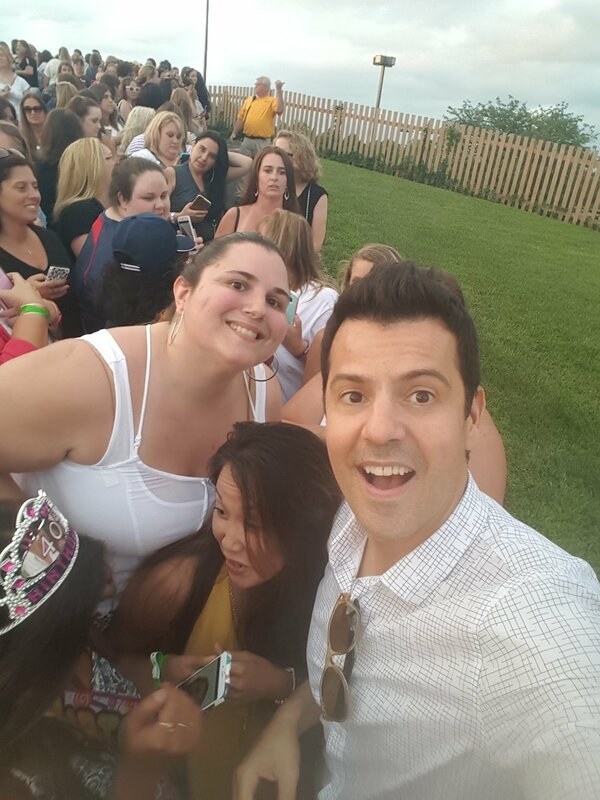 We got to say hi, and get some photos, but at no point was Jordan Knight in a pig pile with us. Donnie a great guy who really is kind to his fans. He knows that fans are the bulk of his career and if you treat them right (like lay on top of them..) they will be loyal fans forever. Thank you Donnie for a cool memory. Here is more about the show that never aired: http://www.nkotbnews.com/2008/12/jordan-visits-donnie-on-set-of-bunker.html - that’s actually my photo of Jordan.